Charles Schwab (NYSE: SCHW) has had a solid year so far. The brokerage’s revenue grew by just over 17% in the first three quarters of 2018, and we expect this trend to continue when the company reports its fourth quarter earnings on January 17. We expect the brokerage’s interest-earning assets to be the main driver of growth in Q4. Additionally, we expect trading revenues to increase marginally as a result of growth in trading volumes, despite the commission pricing cuts implemented in the first quarter of 2017. However, since trading commissions generate only a small portion of the company’s overall revenue, we don’t expect the price cut to have a major impact on its revenue and EPS growth in the near term. Consequently, we expect the brokerage’s 2018 revenue and EPS to grow by 18% and 51%, respectively, and Q4 results will likely be along the same lines. Our price estimate for Charles Schwab’s stock stands at $57, which is around 10% above the market price. We have also created an interactive dashboard – which outlines what to expect from SCHW’s full-year results. You can modify the key value drivers to see how they impact the company’s revenues and bottom line. Below we discuss some of the key factors that are likely to impact the brokerage’s earnings. 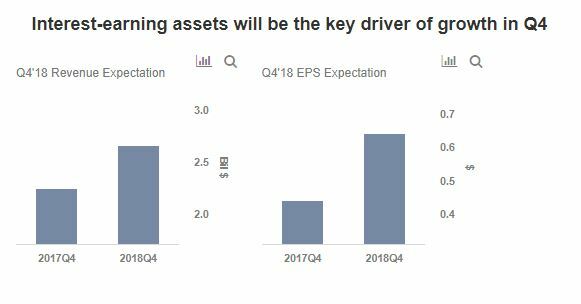 Fueled by multiple Fed rate hikes, Charles Schwab’s interest earning assets grew by 15% in the first nine months of 2018. In addition, the yield on these assets went by nearly 31 basis points during the same period. The solid growth in assets, coupled with the yield increase, has led to a massive 34% jump in interest revenues. With recent hikes and more planned hikes in the near term, we expect the interest generated on these assets – which contributes to roughly half of the Schwab’s overall revenues – to drive near-term growth, due to its high asset base and moderate current yield on these assets in comparison to competitors. Owing to increased competition from discount and traditional brokerages, Schwab decided to cut its commissions per trade by nearly 40% to just under $5. Despite this, robust growth in trading volumes (+22% y-o-y) in the first nine months of 2018 more than offset the losses. Improvement in U.S. GDP, coupled with increased volatility in the stock market, should significantly boost trading volumes in near term – driven by enhanced client activity, which in turn should improve trading commissions marginally. This factor should continue to offset the negative impact of the reduced commission rate.